This composition, in which boats on a river are viewed from above a gorge, is a recurrent one in guohua painting of the mid-twentieth century. 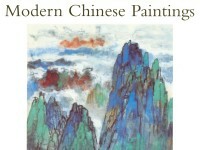 Xie Zhiliu uses intensified classical colours throughout, even for some of the dian (dots) which are generally added in ink, also seen here, to accentuate the forms of the landscape. 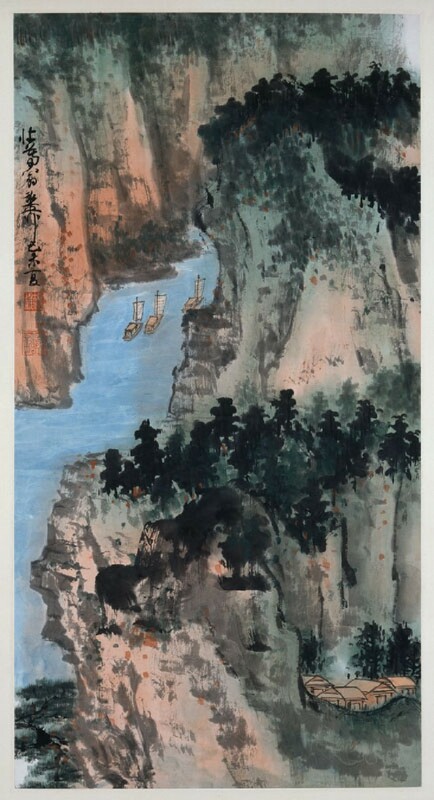 Xie Zhiliu, also known as Zhuangmuweng, is a landscape painter from Jiangsu province, a connoisseur who has written extensively on the masters of the Northern Song dynasty (AD 960-1127). His own landscapes make extensive use of colour within the classical limits of blue, green and buff pigments, which he sometimes brightened by mixing with Western watercolours. In this painting, he uses intensified classical colours throughout, even for some of the dots, to accentuate the forms of the landscape.